Notfinity is negated finity. Microcosms are all things and portions of the cosmos. 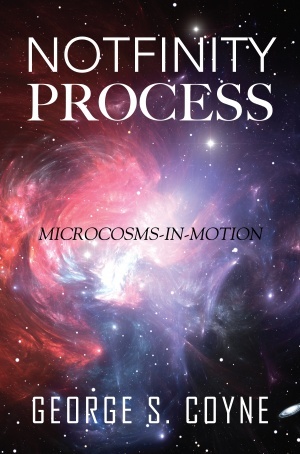 Process is microcosms in motion. Universe is an abstraction of limitless matter. This univironmental, deterministic worldview uses aspects of classical mechanics, and systems philosophy. He catalogs absurdities in orthodox physics such as matterless motion; wave-particle duality; light waves in a void, negative mass; duality of light; superposition and probability waves; cosmological expansion; inflation; Schrödinger's cat; and that the cosmos needs an observer to exist. He discusses invalidating problems in relativity, such as the non-scientific objectification of motion, violations of scientific assumptions, and profound math errors. I show that The Big Bang has invalidating problems. Coyne describes Borchardt’s Infinite Universe Theory; Universal Cycle Theory, and his and Stephen Puetz’s Neomechanical Gravitational Theory. He examines Bryant’s Modern Mechanics Theory, and Shaw’s entanglement explanation and aether gravity model. In a chapter on Bohmian mechanics, Coyne discusses causality and chance; pilot waves and the undivided universe. Included are letters from Bohmian physicists: Dr Basil Hiley, winner of the 2012 Marjorana Prize Best Person in Physics, and Dr. David Peat. Other topics include a rational explanation for the double-slit experiment; Maxwell’s aether, energy, dark matter candidates, and the cosmological principle; alternatives to the galactic redshift interpretation, cosmological expansion and inflation myths, as well as the emptiness myth. Coyne posits that consciousness is an abstraction for cognitive processes, and accounts for the hard problem of subjective experience. He contends that microcosms in motion generate perceptions, which the brain interprets uniquely based on the mind’s neuronal patterns. Coyne explains differences between awareness and consciousness, the cause of dualistic confusion, and describe the Global Workplace Theory. He lists many questions about consciousness and the brain and provides logical answers. Coyne discusses the illusion of the observer, the concept of self-awareness, Antonio Damasio's model, and negative implications of “free will” from brain studies. Other areas concerning the consciousness abstraction include the evolutionary benefit of advanced mental processes, summary of neuroscience discoveries and higher–order thought theory. More topics included in Notfinity Process are Modern Mechanics, the Infinite Universe Theory, and the Universal Cycle Theory, rational solutions of entanglement and the 2-slit experiment, an aether gravity model, and consciousness is an abstraction for brain functions. Originally published in September 2017, as of March 192019, Notfinity Process is in the late stages of completing a second edition. "On the forefront of the next scientific revolution, George is amongst the first to embrace theories like Modern Mechanics, which outperforms Einstein’s theory of relativity. George moves beyond the question of whether Einstein is right and instead begins answering: Where do we go from here? He challenges the scientific worldview by introducing his own ideas while synthesizing thoughts, theories, and ideas of 21st–century emerging physics. Steven Bryant, Author of Disruptive: Rewriting the rules of Physics." "George has done a remarkable job interpreting univironmental determinism, neomechanics, and the assumption of infinity for those who are dubious about relativity, quantum mechanics, and the Big Bang Theory. Monumental efforts like this are just what it will take to finally rid humanity of the silly idea that the entire universe exploded out of nothing." Glenn Borchardt, Ph.D. This page was last modified on 24 March 2019, at 17:33.